Are you seeking skip hire in Rush Green? 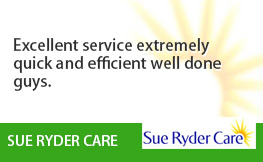 We know that making the right decision when choosing a company can be difficult. However, with our impeccable reputation and returning clients, you’d be hard pushed to find such a level of personal service with any other firm. You can also rest assured that we are fully licensed and insured. Why Choose Us for Rush Green Skip Hire? What makes us stand out from the crowed is our friendliness and flexibility. 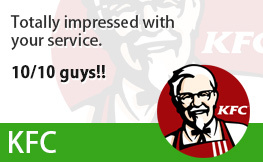 Service is a smile is always a must but there are very few firms who will fully tailor a service to suit your needs. We are open from 7am until 11.30pm, meaning we can arrange your skip hire service to fit in with your day. No matter how busy your weeks are, we will always be able to accommodate you. Having offered skip hire in Rush Green for over 15 years we have seen countless customers returning to us for other jobs. They can’t be wrong, can they? When we arrive, we won’t just abandon a skip outside your property and expect you to get on with it. 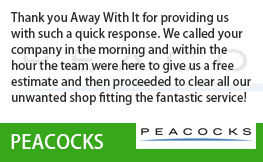 We are celebrated for our customer service and will be there throughout the process to ensure you are happy. If you are having any problems, we are only a phone call away, and we can be on the road and ready to lend a hand! If you are worried that you don’t have space for a skip, don’t panic. We offer an alternative. Our two-man waste disposal teams have nifty trucks that can pop to your home and help you shift that unwanted waste quickly. This saves any need for a skip to be sitting outside your house. Don’t feel like you need to make a decision straight away, however. We’d be more than happy to discuss the benefits of each option with you to help you make the best decision. 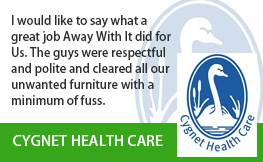 At Away With It, we genuinely care about our customers. 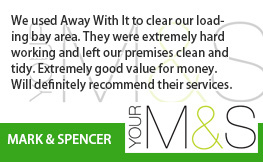 We know how tiresome it can be when you want to clear out the loft or get rid of builders’ waste. 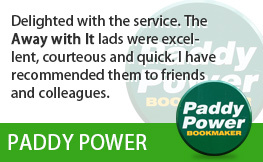 Our team are close-knit and we want our customers to feel like they are part of the inner-circle too. That is why we deal with every client’s requirements on an individual level. With us there is no one-size-fits all skip hire solution. We can chop and change so that the result is bespoke to you. Come rain or shine, our friendly teams are ready to book in your Rush Green skip hire. If there is waste driving you bananas, you can rest assured the Away With It team will be there to help whenever is best for you. All our quotes are free and without obligation. Furthermore, we will always suggest the most cost-effective solution for your needs. If our teams are ahead of schedule, there is even a chance we could pencil you in for the same day! 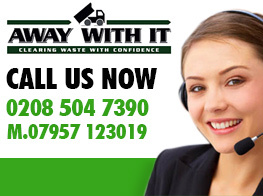 Call one of our friendly team now via 0208 504 7390 to discuss your skip hire needs.